Sanebox helps professionals save time on dealing with email. The Sanebox algorithms determine the importance of each email to the user, move all unimportant messages out of the Inbox into a separate 'Sane Later' folder and aggregate them in a daily digest. Sanebox doesn't require training, there's no plug-ins or downloads, and it works on ANY client and service. Reminding you when an email you sent was unanswered, and more! SaneBox is an intelligent system that learns from user actions and can be further personalized through customizable settings. It is like a big filter that works on the layer just before emails reach your inbox. The service creates a separate 'SaneLater' folder in your email account and when mail arrives, SaneBox decides if it needs to be discarded, enter that folder, or if can go straight into your inbox. By structuring different tiers of importance, in addition to filtering out the e-mail that SaneBox predicts that you won’t read, users can have their e-mail organization done for them automatically. 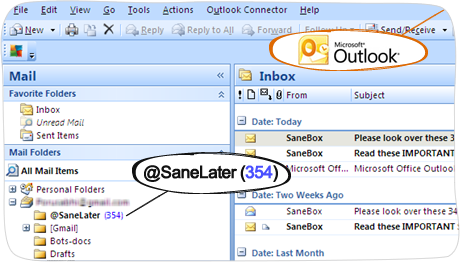 Playing off of the out of sight, out of mind ideology, SaneBox offers a variety of deferred filters, such as “SaneTomorrow” and “SaneNextWeek,” that will pull e-mails out of your inbox only to reappear tomorrow or next week, respectively. You will then receive a daily summary of the diverted messages and can set up follow-up reminders on any message at desired intervals. By removing everything other than only the most important e-mails, a user is capable of focusing their time on only what’s urgent. Other features include smart reminders, email snoozing, and calendar sync and Sanebox works with all of the major e-mail clients including Gmail, Microsoft Outlook, Apple Mail, Mozilla Thunderbird, and Yahoo!. Sign Up for Sanebox Now! Email overload is a genuine business crisis. The problem is that the vast majority of emails received aren't important. Unfortunately, the few that are can easily get lost in the noise. That is a big hit on productivity and business efficiency. An incredible amount of time is wasted in our inboxes over the course of a day. An average employee spends 13 hours a week reading and responding to email, which is a whopping 28% of our work time. The question is how much of this time could be saved by implementing the right email tools and strategies? The answer: A WHOLE LOT! Our ability as humans to concentrate is severely impacted by constant interruptions. Focusing on any task, no matter the complexity is difficult while constantly being interrupted by emails. A case study conducted by the Danwood Group found it takes 1.5 minutes on average to read and recover from an email. Lets say an employee is alerted every 5 minutes when they receive new mail, which means there’s potential for 96 interruptions in a regular 8-hour workday. If it takes 1.5 minutes to read and recover from an email this leaves 3.5 minutes until the employee is interrupted again. Now lets say this same employee changes the alert to go off every 45 minutes instead of 5, this means interruptions decrease to 11 per day. If 9 emails accumulated over 45 minutes it will take 6 minutes on average to read and recover from the interruption, which leaves 39 minutes until the next interruption. This shows how decreasing the frequency of email related interruptions can save you a significant amount of time. The bottom line is the longer you're able to concentrate the more productive you can be through out the day. Every one of us desires to increase our personal productivity and that of our employees, if we have them. 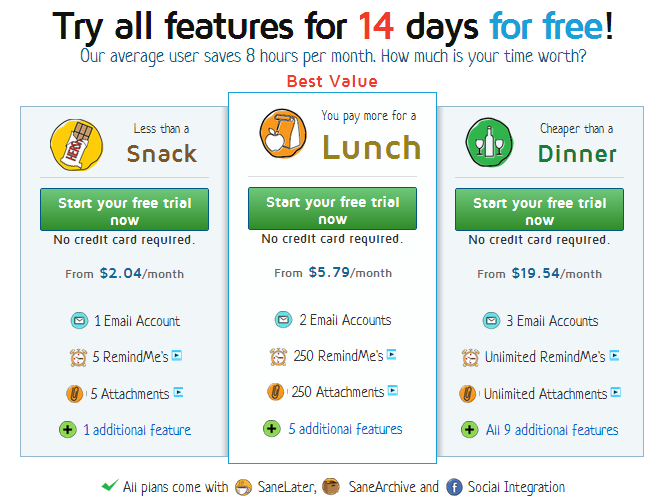 That is why Sanebox was developed - to help save you time by cutting down on distractions. While SaneBox made its name in the consumer market, it recently introduced its first enterprise product which is compatible with Google Apps, Exchange, Outlook, Lotus Notes, and multiple other email clients. The product is entirely cloud-based, freeing individual users and corporate IT from downloading or maintaining any application. Sanebox helps users focus on what's important. It keeps important emails in the inbox, places unimportant ones in a separate folder for bulk processing, and aggregates them in a digest. The average user saves 2 hours a week processing emails - that is 8 hours a month saved or an extra working day! SaneBox, announced another impressive update to its service, partnering with Dropbox to securely host your attachments in the cloud, making them easy to find and reducing the footprint of enterprise email inboxes everywhere. Now, when your receive an email that has an attachment, SaneBox automatically connects to your Dropbox account, uploads it and then returns a publicly shareable link, which is then added to the email. Instead of trawling through your inbox and hundreds of messages to find your files, SaneBox makes them accessible from the desktop or even a mobile device. SaneBox’s Dropbox integration works in a number ways. It can simply filter and strip attachments from your email or it can be set to only kick in once a file-size threshold has been reached. Sanebox can keep the original attachment if you wish, and it’s all reversible via the Settings panel. SaneBox recently introduced a Salesforce integration that makes email messages from leads and contacts in Salesforce a top priority in a salespersons inbox. In other words, a salesperson can now filter their inbox according to income potential. The new SaneBox integration is available to existing Salesforce.com enterprise users in the AppExchange, however API access limitations mean that the feature is not available on Salesforce Group and Professional plans.